Capacitance is a physical quantity, which refers to the charge storage under a given potential difference, while coupling refers to the process of signal transfer from the first stage to the second stage, which is usually referred to as AC coupling when it is not marked. For the circuit, it always has the driving power supply and the driven load. If the load capacitance is larger, the drive circuit has to charge the capacitor and discharge it to complete the change of the signal. When the rising edge is steep and the current is larger, the driving current will absorb a very large power supply current, because of the inductance and the resistance in the circuit(especially the inductance on the chip pins, which bounces back), this current becomes a noise compared with the normal state. In other words, it is an interference that affects the normal work of the front stage, which is called coupling. The product of the combination of the two is the coupling capacitor, in which a kind of audio coupling capacitors are used to eliminate DC signals from AC signals, so that the overall performance is balanced, without noise, so you can enjoy the sound quality music. 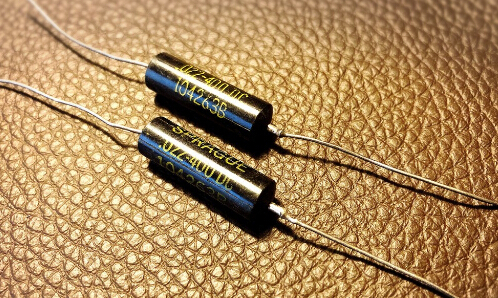 Audio coupling capacitors, because of its characteristic, are very popular for music enthusiasts. In order to have excellent audiovisual quality, using audio coupling capacitors will certainly be good for a better sound quality. Do you know the function of audio coupling capacitor while listening to the music? What is its principle? In audio systems, DC sources are used to power audio circuits. However, because audio signals are usually AC signals, DC components are not required for output. In order to prevent the DC signal from appearing on the output device, a coupling capacitor is needed in series on the load. When the capacitor is connected to the AC circuit, the voltage of the circuit connected with a pin increases gradually, and then the charge accumulated at the high potential is returned to the circuit when the voltage of the circuit connected by the pin drops. The same is true at the other end. Because the capacitor is insulated, there is no current pass through the capacitor, but it accumulates and releases charges as the potential rises and decreases, making people mistakenly assume that there is a current passing through. Therefore, it can stop DC signals, as for AC signals, in the form of elevating and lowering potentials at both ends, can be coupled to the following circuit elements. 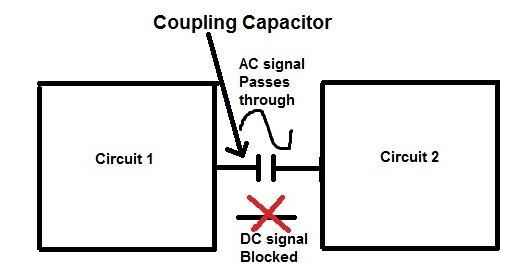 When using coupling capacitor, the capacitor can allow the AC signal to pass through normally, while the DC current of the upper-stage amplifier circuit is cut off, so that it will not affect the working point of the next stage amplifier circuit. Why can capacitor make AC current pass and stop DC current? Two electrodes of a capacitor can store electricity But it does not form a circuit loop. DC can charge the capacitor, but when the voltage at both ends of the capacitor and the supply voltage are same, in other words, the circuit is stabilized, there will be no current pass through. The positive half-cycle of alternating current charges the capacitor, and the negative half-cycle discharges the capacitor. The constant charge and discharge is equivalent to the current flowing through the capacitor and forms the path. Coupling capacitor, also called electric field coupling or electrostatic coupling, is a coupling mode caused by the existence of distributed capacitance. Coupling capacitors make the two systems of strong and weak electricity coupled and isolated through capacitors to provide high-frequency signal path to prevent low-frequency current from entering the weak current system and to ensure personal safety. In addition to the above mentioned functions, the coupling capacitor with voltage extraction device can also extract the power frequency voltage for protection and reclosing, which acting as a voltage transformer. The function of coupling capacitor is to transmit the AC signal from the previous level to the next level. Coupling methods also include direct coupling and transformer coupling. The direct coupling efficiency is the highest and the signal is not distorted, but the adjustment of front and rear working points is complicated. In order to keep the working points of the latter level free of the influence of the previous stage, it is necessary to separate the former stage and the latter stage in the direct current, while at the same time enabling the smooth transmission of AC signals from the previous level to the latter level. In a word, the way to accomplish it is to use capacitor transmission or transformer transmission. They can both transmit AC signals and cut off DC signals so that the points related to the front and back levels will not interfere each other. The difference is that the phase of the signal will delay when it is transmitted by capacitor, and the high frequency component of the signal will loss when it is transmitted by transformer. In general, when transmitting small signals, capacitors are often used as coupling components, while transformers are often used as coupling elements when transmitting large signals or strong signals. It is worth mentioning that the capacity of coupling capacitor is better not to change at will. When I tried the Western Electric 0.1uf, I felt slightly weaker at the middle and low frequency, so the capacity was doubled in pairs in parallel, but the result was that the sense volume of medium and low frequency was not increased much, what’s more, the middle and high frequency had shown condensing, it was not reflect the real quality of Western Electric products. In order to increase the permeability of the black MKP of Sprague, the capacity of 0.2uf was halved, resulting in loss of sense volume and single sound. According to the principle, capacitor is the detailed and transparent as front-stage input coupling and the thick-warm type as final stage input coupling. New capacitors should listen at least 2-3 days to draw conclusions, this is a lot of expert advice, I have the experience in practice. After a few days of testing experience, sound will become more penetrating, analytical, and natural. Coupling capacitor is a kind of coupling mode caused by the existence of distributed capacitance. As one of the typical capacitors, the audio coupling capacitors play a role of separating the previous stage from the next stage in the DC aspect, which does not make the working points of two stages affect each other. How to select the audio coupling capacitor? What about the volume of the audio coupled capacitor? What is the function of the audio coupling capacitor? Coupling capacitor is a passive component that make the force and weak electricity systems coupled and isolated through capacitors to provide high frequency signal path to prevent the power frequency current from entering the weak electricity system and to ensure personal safety. Audio coupling capacitors are used on related music circuits for the purpose of enjoying the better sound quality. Why use audio coupling capacitor? To prevent unequal DC voltage of two ends from being connected to affect the DC circuit, which makes the working point of the front and rear stages irrelevant. Capacitors can transmit AC signals and cut off DC signals, in common use in AC amplifier circuits, circuits with DC interference are also often use coupling capacitor to isolate interference signals. 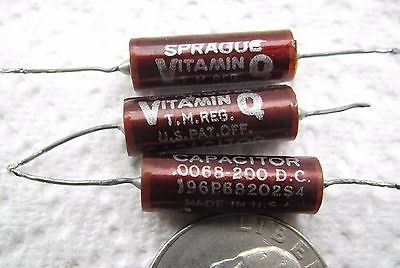 Sprague's VQ v-cap is famous, 0.1uf/400v about 3 us dollars at domestic, it is economical and practical. But after trial, VQ's high-frequency analytical power is very poor: permeability is not good, sound is dull, sound in medium and low frequency is thick, speed is slow, dynamic is general, the only good is that the sound is softer and the music feeling is good. But always feel that the voice hazy can not open, the sound in high frequency is not performed well. Probably I didn’t get its key terms, so I went around and consulted. Some senior executives said that the capacity of replacing thin film capacitors with VQ should be reduced by 1/2-1/4. So use the VQ 0.22uf to replace the VQ 0.1uf in the original position, the results showed that the high frequency slightly improved, but the sound became lighter, thinner, without the original thick feeling. To analyze whether it should be the high frequency extension or not, in fact, it is false impression that the high frequency seems to improve a bit. According to the industrial insiders, VQ is not used for audio, but for power. The TCC is seemed old, with a transparent plastic shell on the outside, and a 0.1uf/350v is about 3 us dollars at domestic. The first feeling of switching to TCC is surprise: the sound is thin, clean, transparent, high-frequency analytical power and high end extension are very good. Relatively speaking, medium frequency is not very outstanding, but the texture is good, and it is very refreshing. transparent, meticulous, the details of the music temperament explained clearly, come straight to the point, and sound field is also very broad. The overall sound quality is slim, but a not too thin, music sense is not inferior to VQ. But its mid-sound is not thicker than VQ, the deficiency is that the low frequency sense is slightly less, the overtone is not enough, and the cello's box vibration is less, so the sound will be light when listening to the cello, especially when the bipolar coupling capacitor is fully used in the TCC oil-impregnated capacitor. Some experts say that the capacity of TCC should be halved, but according to my personal experience, TCC capacity can not be reduced, otherwise the sound is too thin, low frequency sense volume is not enough. It is important to note that leakage will occur when TCC oil-immersed capacitor is used for a long time, and the 350V voltage can only be used in coupling at the input end, otherwise it will leak, causing sparks if light, and burning pipes with heavy pressure. It is said that v-cap need an iron case package to avoid leakage, but the TCC doesn’t provide an iron case package. Therefore, the use of TCC v-cap should pay special attention to safety. The unit price of 0.1uf/400v capacitor is also 3 us dollars. 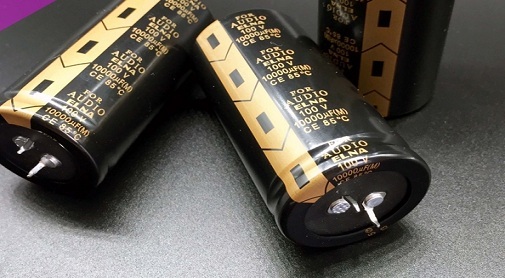 Many people say that the black beauty capacitor is an oil-immersed capacitor, but it is actually a thin-film capacitor. Black beauty 's timbre lies in the middle of VQ and TCC: for high-frequency extension, meticulous and transparent quality, it can not compare with TCC; on soft sound, music sense, and medium-frequency thickness, it is weak than VQ. But from another point of view, its high frequency extension and analytical power are better than VQ; the middle and low frequency thickness is better than TCC. Learn from others' strong points and close the gap, its music sense is good, although it will not surprise you, it also won't make you frown. In a word, a good match is also desirable. So, despite it has more or less shortcomings compared with the other, the black MKP capacitor has always been my backup. I have three pairs of 0.1uf/1000v WEST-CAPs. 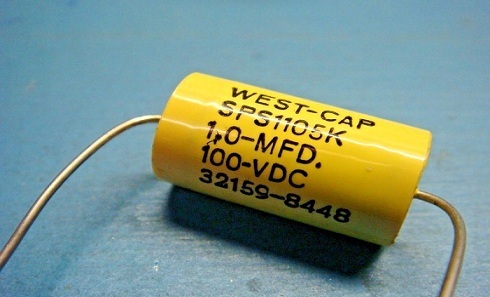 WEST's style is similar to that of TCC capacitors, but its high frequency extension, sound fineness, analytical power and musical sense are higher than those of TCC, but its shortcomings are also slightly larger than those of TCC, and its low frequency sense of quantity and overtone is slightly less than that of TCC. For example, the piano sound is clear and transparent, but lacks of sense of reality. The sound of listening to the cello is more pronounced, less string-shake, a little like a violin. The WEST-CAP uses iron-shell package, it is better than TCC capacitors due to its less leak characteristic. Therefore, I prefer to use the WEST capacitors after I have abandoned the TCC capacitors. The red WIMA has several models, the most famous of which is the MKP-10 series. The earliest I tried is MKS-4: thick sound, poor analytical power, non-transparent, in one word, its performance is not good. Later, friends sent me a few MKP-10 series, is really good, it is really appreciate the charm of red WIMA. At that time, I used six electric 0.1uf and two 0.3uf to make inverse-phase earthing capacitor. After the listening test, I found the sound of cello's lack of overtone, I switched in with the MKP-10 capacitor with 0.33uf/400v. Obviously, the sense of medium and low frequency is much higher, although the high frequency is not so delicate and transparent as the WEST-CAP, with more low frequency , the sound balance feeling good. It is more softer, having good musicality, a bit like Sprague’s black beauty, whose voice is warmer and thicker, but red WIMA’s MKP-10 is more transparent and analytical. One company ever advertised that the home-made CD machine with EC capacitor can outsell the imported CD machine. So I still find some EC capacitors to test. When I put the 0.1uf/850v 's EC capacitor into the coupling end, the sound of it makes me surprised, it has a lot of high-frequency sense, but its sound is very strong, bright, and noisy, that is, the sense of music is so bad that it will soon be annoying. Later it was put on the decoupling capacitor, it was also feeling uncomfortable. 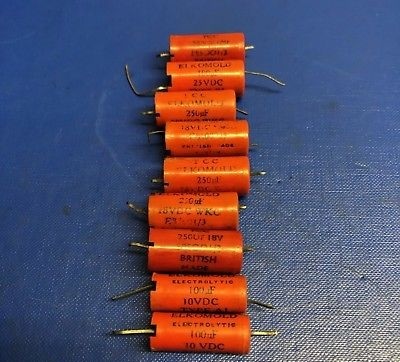 I haven’t try out the 80uf/30v EC capacitor, I do not know if they are the same series. Most people have used Japanese ELNA gold capacitors, SILMIC's voice is gorgeous, DUOREX feels round and soft, etc,. I am prefer the SILMIC, the sound contour is more obvious, belongs to bright-coloured type. Listening to pop, hit, symphony is not bad, but after a long time, more or less will feel a bit noisy, but compared to other electrolytic coupling, I felt better. For example, Nikon: regular and plain; Panasonic: middle frequency is thick, high frequency is not delicate. ; RIFA: it is too delicate, mid-frequency has a little thin. In addition, the ELNA red robe is also good, the voice is noble and gorgeous, soft and delicate. After more than a year of comparative audition, I finally chose WEST-CAP and SPRAGUE black beauty. When the first stage of 0.1uf is coupled, the sound is fine and transparent, and the music sense is good; the black MKP 0.1uf is connected in two parallel to 0.2uf when the second stage is coupled, and the sound is soft and thick, which is complementary to the WEST-CAP. 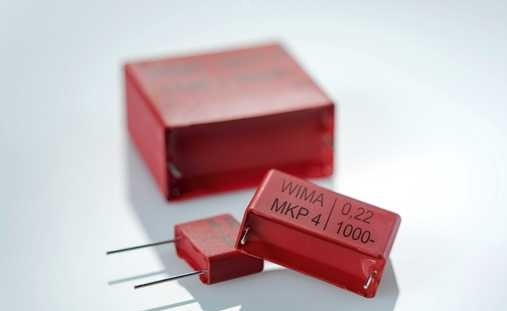 The inverted phase of the grounding capacitor selects red WIMA MKP-10 series 0.33 UF, due to its sound careful balance, the actual listening sound feeling slightly thin, and then paralleled with a 0.22 uf capacitor, the sound effect is good. a) How to choose the volume of audio coupling capacitor? Essence: the coupling capacitor and the input resistor of the next stage constitute the RC high-pass filter. To ensure the lower limit frequency of the input signal can pass through the "RC high-pass filter", the lower limit frequency of the RC high-pass filter cannot be higher than the input signal frequency. A high pass filter is designed to ensure that the input signal does not decay, so the capacitance value can be calculated by the formula. It can be seen that this input signal has two characteristics: the frequency is very low and the amplitude is very small. According to common sense, the larger the capacitor capacity, the lower the frequency of the signal. When the current input signal frequency is 1Hz, and the capacitance is too large and the charging time is too long, resulting in the output signal delayed. Especially when the input signal amplitude is very small, pay special attention to this problem, otherwise the circuit will become very slow. The best choice: the capacity of the coupling capacitance should be selected to ensure that the input signal through the coupling capacitance after no attenuation of the minimum capacity value. If there are multistage coupling in the circuit, the I / O coupling capacitance of the first stage should be minimized, and the coupling capacity between the later stages is doubled than that of the previous stage. Such a combination will ensure the perfect presentation of the amplitude and frequency characteristics of the audio signal channel throughout the circuit. In general, coupling capacitors make sense only in circuits with AC signals, because the current divided into alternating current and direct current in the circuit. In general, we only need to amplify the AC signal to filter out the DC signal, because the DC signal can affect the operation of the next stage amplifier. We can transmit only the desired AC signal to the next stage amplifier by using the characteristics of capacitors. This is the coupling capacitor, the output coupling for the previous amplifier, and the input coupling for the next amplifier, which can be the same capacitor. In general, the value of coupling capacitor in audio signal channel is not very large, from zero to dozens of uf. The audio coupling capacitors have certain influence on the power amplifier and the crystal machine. The electron tube is generally 0.1uf-0.22uf and the crystal machine is 2.2uf-4.7uf. The tone of small capacity is more bright, on the contrary, bass is better. In addition, for some special circuits, the coupling output capacitance may be larger, which is related to the supply margin and quality of the front-end power supply. In a power amplifier, the cost of the power supply should account for more than one third of the total cost, which is sufficient to explain the importance of the power supply. 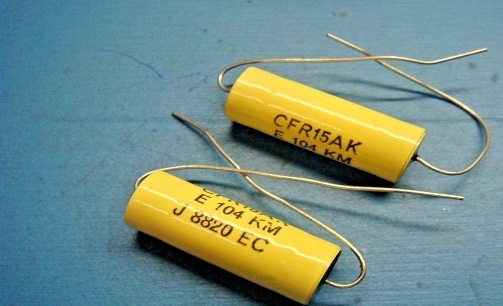 The capacitors required for the power supply include: large capacity filter electrolytic capacitor, high frequency filter small capacitor, which applied to the filtering of rectifier output, in addition, if it is necessary, a small high-frequency filter capacitor can be installed on the rectifier tube. Because the power frequency used in domestic civil power network is 50Hz, there is still existing AC voltage after rectifying by rectifier. According to the different composition of rectifier circuit, the AC frequency of 50Hz still exists after half-wave rectifying, because the input frequency is 50Hz. The half-wave rectifier circuit eliminates the half-cycle of AC and does not change the frequency of AC component in unidirectional pulsating DC. The full-wave rectifier circuit is the same as the bridge rectifier circuit. The positive and negative half cycles of the input AC voltage are used to increase the frequency to 100Hz, so the main component of the unidirectional pulsating DC is 100Hz. This is because the rectifier circuit changes the polarity of the half turnover of the input AC voltage, so that the frequency of the output DC pulsating voltage is twice as high as the input AC voltage, and the increase of this frequency is beneficial to the filtering of the filter circuit. So the filter capacitor needs to be electrolytic with large capacity. Generally, an amplifier with more than 10W power selects the 1000uF electrolytic capacitor, theoretically, the capacitor capacity should be doubled when the power is doubled. The high frequency capacitor is to filter the high frequency interference signal which exists outside the devices, make the background noise of the power amplifier smaller, in addition, the high frequency capacitor is generally between the 0.001uF~0.68uF.